As I was coasting down the Manhattan Bridge’s final slope into Chinatown this afternoon, I realized that the orange-line train to the left of my bike, descending the same slope, was tracking my speed exactly, and when I turned I saw the conductor grinning at me. He must have been waiting to see if I would notice. He waved, and I waved back with a wave that nearly knocked off my own bike cap, so when I recovered I waved again for good measure. I’m trying to shift my attention, this week, from one project to another, and all I seem to be able to think of are disconnected anecdotes, some of which I have carried around for more than a year now. For instance, there’s the story of the local church book fair. Attending it a few years ago, I found a first edition in its dust jacket of a not terribly well-known novel from the 1930s, which, I knew from having looked the title up on Bookfinder not long before, some booksellers priced in the thousands of dollars. I bought it for two dollars! I was tiresome about it at dinner parties for months afterward, though of course the profit to be made remained theoretical, because I couldn’t bear to sell it, and it sits on a shelf a few yards from this keyboard as I type. (Moreover, as long perusal of the blog Bookride has taught me, books that are priced on the internet at ridiculous prices do not necessarily sell at such prices.) At next year’s church book fair, I was prepared to score triumph after triumph, but when I arrived, a few hours into its progress on a Saturday morning, I found it filled with college-age people carrying handheld scanners. They picked up book after book—bleeping their bar codes, checking prices on the internet, and plopping all titles worth more than a predetermined threshold into large boxes between their feet. Automated capitalism had destroyed another niche of humanism, I moaned to friends, making myself tiresome in a new way at that year’s dinner parties. A friend pointed out that it could be argued that the injustice was actually in the previous state of affairs, when card counters like me knew that particular 1930s novels harbored literary value, and that the internet-connected scanners merely evened the playing field. (They didn’t even it completely, of course, because 1930s first editions don’t have bar codes. They don’t even have ISBNs.) But it was strange to watch a technology that gave to people who didn’t even necessarily have the habit of reading books the ability to judge their value. At the time I had also been bewailing the disappearance at the local YMCA of the Plexiglas book holders for the elliptical trainers. One by one the book holders had cracked and been discarded, in a process as gradual and inexorable as the upgrading of the elliptical training machines themselves, which were alwyas replaced, when they broke down, by machines with pre-installed television monitors. In the end, every elliptical trainer in the gym had a television monitor, and there were no more Plexiglas book holders. Instead there was a thin ridge beneath each television screen, where it was possible to prop up a glossy magazine, if the magazine wasn’t perfect-bound. Without the restraining lip of something like a Plexiglas book holder, however, perfect-bound magazines and books tend to get jiggled shut by the vibrations of an elliptical trainer in use. I tried for a while artfully folding a towel over the corners of my books’ pages, to keep them open by weighing them down. But the towel had to be refolded every time I turned the page, and there was in addition the social pressure of being the only person in the gym to insist on reading a book when so many nice television screens had been made conveniently available. Somehow the two phenomena—the deployment of the handheld ISBN scanners and the vanishing of the Plexiglas book holders— seemed of a piece, at least in my mind, as if technology and the pursuit of economic efficiency were rationalizing the reading of books out of existence. Not long afterward, I quit the gym, because I was riding my bike all the time anyway. At this year’s church book fair, which took place not too many weeks ago, there were fewer dealers with handheld scanners, and none of them seemed to have hired college students to help them for the day, as they had the year before. The books themselves seemed to be of lower quality; maybe the church had invited a bookseller to buy the better titles for a higher price beforehand. This time around, the economic metaphor, if there was one, seemed to be that in a recession people were pleased to have an opportunity to buy cheap things in large quantities—to fill a cloth shopping bag with books and pay no more than twenty dollars. I got half a dozen Classiques Garnier paperbacks from the 1950s, in yellow covers with sewn bindings and “vellum” paper—Stendhal, Rousseau, and Voltaire, perhaps someone’s college curriculum. 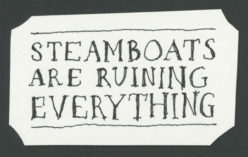 No doubt you have wondered what the mysterious blogger behind Steamboats Are Ruining Everything sees when he looks up from his laptop. The answer (at least when I work at the kitchen table): a lot of sky, and a few backyards in southern Park Slope, Brooklyn. You can see the view for yourself at left, as improved by the art of our friend Matteo Pericoli. Having drawn Manhattan from the inside and the outside , Matteo has returned to draw New York as sixty-three of its writers, architects, designers, and producers see it, in a book titled The City Out My Window . Besides our window in higher-fi, and a few of my thoughts about it, the book features the windows of Mario Batali, Stephen Colbert, Nico Muhly, and Lorin Stein. Matteo promised not to show the interior of anyone's home, and he doesn't, but the views are strangely revelatory anyway—inside-out Peeping-Tomism, somehow. For further sample peeks, including the views of Mikhail Baryshnikov and Wynton Marsalis, check out Matteo's website.